Hacking the APEX error page! Wouldn’t it be cool and much user friendlier to have this error message displayed as inline message, as we can do it for validation processes? You thought that’s not possible, because when the page is re-rendered, all the changes in the tabular form are lost… It is possible! But first try out the following examples. 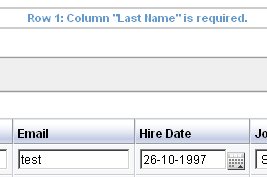 Enhanced Tabular Form example with inline error messages. Vola, that’s it! If an error message is displayed now on the APEX error page, the text will be extracted and pasted into the caller page. Or if you have any other suggestions or problems, don’t hesitate to drop me a note. I haven’t done a lot of testing yet, but it seems to work fine with FireFox 2.0 and IE 6.0. Don’t forget to check out the other ApexLib framework solutions! This entry was posted in ApexLib and tagged APEX hacks, error, tabular form by Patrick Wolf. Bookmark the permalink. 2. Log the entire error message into an error log table. P.S. It works in IE70 as well. That’s the wrong place to put such code. What we really need is an application/page level event which fires when an error occurs where we have the possibility to change and log the error message. I really hope that we are getting such an entry point in APEX V3.0. This is really nice. Great work! thanks for letting me know. I think it depends on the PC speed and the browser. I also see it randomly with Firefox. I have already logged a bug for that issue and will probably fix it in the next release. I think the solution is to add a “display:none”, to hide the error on the error page. What username and password should I use, to see the code in the examples on this page ? I’m learning the most by seeing some code. the Demo Application is included in the ApexLib distribution. It’s in the Examples directory and you can load it into your own workspace. Thanks for your great ApexLib! Still I have a problem. When I have a database error (ie. raised by a trigger in the db), the screen flashes with the (old style) error and the normal page will be shown. When I debug in Apex, I can see the error (also in old apex-style). Other error messages like inline messages work fine. What did I wrong? have a look at the report templates (Shared Components) and there at the “column template” setting. Use the “Standard, Alternating Row Colors” as an example where you see how the conditions work.